I have written about the explosive mobile broadband growth in Austria – Sweden is yet another country where mobile broadband growth is rivaling fixed broadband options. This is not very surprising given how competitive mobile broadband is being priced in Sweden compared to that of fixed broadband. Sweden’s National Post and Telecom Agency (PTS) publishes an annual report on the state of the Swedish Telecommunications Market. The 2007 report has several interesting data about the state of the mobile broadband in Sweden called “mobile Internet” in the report. 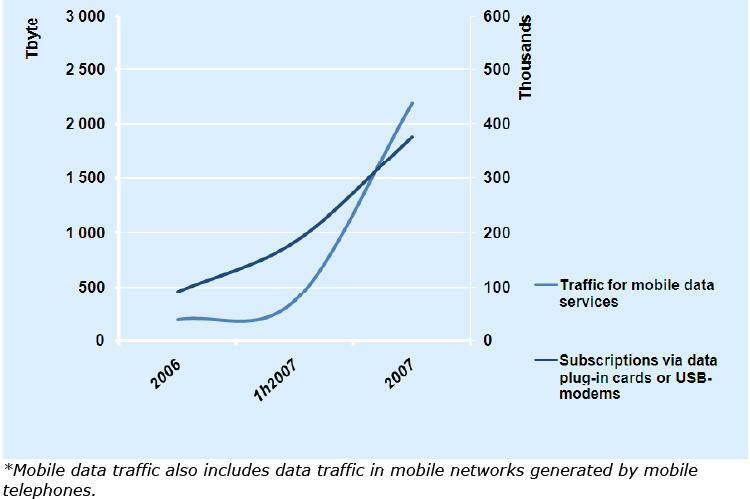 Clearly, 2007 was the year for mobile broadband in Sweden. During 2007 the number of mobile subscriptions via data plug-in cards or USB modems increased from 92,000 to 376,000 representing a growth rate of around 309%. Apparently, this frenetic pace of growth has shown no signs of slowing down in 2008 as well. USB modems for mobile Internet have for instance been at the top of the sales figures in both Telia Sonera and (3)’s shops during the first months of 2008. This rapid growth in mobile broadband subscriptions has been exceeded by a even more faster rate of growth in mobile data traffic as the accompanying figure illustrates – total mobile data traffic increased by over 1000% during 2007 (from 203 Tbytes to 2,191 Tbytes). This follows a similar pattern in all the countries where mobile broadband is showing explosive growth – traffic increases at a rate significantly greater than the revenue from mobile broadband subscribers, given that the latter pay a flat fixed fee for their subscription. As a matter of fact, total revenues from mobile data traffic in Sweden increased by 60% – compare that to 1000% growth in mobile data traffic! Telia Sonera with 39% of mobile broadband subscriptions is the market leader. The next largest is Tele2 (25%) followed by 3 (19%) and Telenor (15%). The smallest is Nordisk Mobiltelefon (who is actually a CDMA operator operating in the 450Mhz band) with less than 3% of the market. What’s the outlook for mobile broadband now? At the end of 2007, roughly 78% of Swedish households had some kind of Internet access with 62% of the households having broadband connectivity. We can fully expect that the 16% of the households with dial-up access will choose some flavor of broadband in the near future. Mobile broadband is perfectly placed to win over this customer segment – in addition to the 22% of households without any Internet access. In fact, mobile broadband jumped to 12% of all broadband subscriptions in 2007 from a 4% base in 2006. In addition to an extremely competitive price – flat-rate mobile broadband connections with speeds of up to 7.2Mbps are available for SEK199 (US$30.80)) a month, comparable to the price of a 500Kbps fixed-broadband subscription, around 1 million of Sweden’s 4.5 million households are outside the reach of ADSL. Many Swedes are also opting for a mobile broadband connection when they migrate to holiday homes in the countryside during the summer. With no fixed broadband offerings to protect, it is a reasonable bet that (3) will go after this segment aggressively similar to its approach in the other countries in which it operates.